Situated in its own grounds in a hamlet between Megrit and Jugon Les Lacs. Jugon is a ‘petit cite de caricature de Bretagne’. The medieval town of Dinan is 20 minutes away and the northern coast (including ferry at St Malo) is 40 minutes. The house is built in stone and enjoys a large garden. Ground floor: New Kitchen/Breakfast room, Dining room (one wall of renovated stone with decorative arch and large Breton fireplace), Study, Living room, (wood burning stove), bathroom and laundry room. First Floor: 3 double bedrooms (2 double and 1 twin/double), and 3 bathrooms all ensuite. Second Floor: 1 huge double bedroom and ensuite living room (suitable for family). FREE ENGLISH and FRENCH SATELLITE TV and FREE WI FI INTERNET. A heated communal outdoor swimming pool is just 5 minutes away by the side of the lake in high season. Property Location: Le Tertre de Fresne is situated in its own enclosed, extensive grounds in a very quiet hamlet mid-way between the picturesque towns of Megrit and Jugon Les Lacs. A tarred single-track road leads to the hamlet, which contains about 10 houses, including a working dairy farm (ideal for children!). Megrit and Jugon are both about 5 minutes away by car and contain a number of local shops and other facilities. Jugon, in particular, is a really pretty town. It is a ‘petit cite de caractere de Bretagne’, with a lovely traditional town square with a boulongerie (for freshly baked croissants etc! ), charcuterie, grocery, post office and banks. The town also contains a number of excellent restaurants, including a creperie, and traditional French bistro with set menus from about 10 Euro (we recommend this one particularly highly!). Jugon also has swimming and sporting facilities. Local Attractions: About 20 minutes away is the medieval town of Dinan, which contains numerous restaurants, cafes, art and craft shops, medieval sites (castle, walls, churches etc.). The town is divided into two; the main part is surrounded by medieval walls and castle, with lovely cobbled streets and out door cafes. The second part is located around the small port on the river, with more restaurants and boat cruises to St Malo, Dinard or even the Channel Islands. Dinan also has a superb hyper-market on its outskirts (Le Clerc) which is open 6 days a week, including lunchtimes! 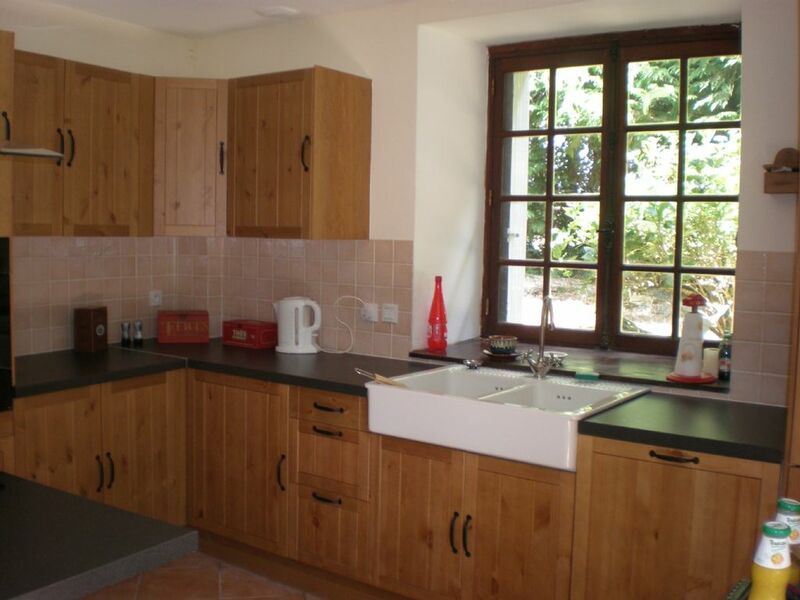 The property is very conveniently located for reaching the northern coast. Resorts such as Dinard, St Jacut, Erquy etc, with their great beaches, are all a maximum of 40 minutes away. There are also many inland sites reachable within roughly the same time such as medieval Josselin and Moncontour. Getting there: The closest channel port is St Malo, which is only 40 minutes away, but Cherbourg, Caen etc (with their faster crossings) are still only 3 hours drive away. It is possible to come via the Channel Tunnel, but be prepared for about a 6 hour drive! There are 4 bathrooms in the house and they all have been recently renovated. There is plenty of hot water for all. Stuart and Julia guided and supported us through the booking process and answered all questions promptly. The directions to the property were accurate and although the house is located in a small hamlet away from main roads and towns, we found it easily after a fairly long drive from Calais. The photographs on the website do not do this property justice. It is quite simply amazing and everything we hoped for. The house is huge with lovely rooms and furnishings and the kitchen had all mod cons. The garden, well gardens actually, provide privacy but a lovely setting. Brittany is such a lovely area and Dinan and St Malo are a must and are both less than 45 minutes away at most. Jurgon Les Lacs is also a must and that is much closer - as are supermarkets and petrol etc. I highly recommend this property and will definitely be returning here on holiday again. Thank you to Stuart and Julia who were excellent. Thank you so much for your wonderful review from July 2018, which has confirmed that we are always striving to provide our guests with the best possible experience. As a number of guests have mentioned that the pictures do not do the house justice, we will try to take some new ones over the next few days, as the weather is so perfect. With my wife and two friends who had never been to France, we planned to stay at Les Vignes for 21 days. From the description of the property and it's location it seemed ideal for us. To say our stay has been very disappointing is a gross understatement...it was tantamount to disastrous. The overall cleanliness of the property left a lot to be desired (the BBQ needs condemned, the place was covered in cobwebs, the doors didn't close properly etc. etc.) and whilst described as 5 minutes from the village of Jugon Les Lacs it was more like a 10/15 minute drive! Ther was no telephone signal and no wifi connection......facilities which were crucial to our stay and clearly advertised. This fact was immediately made known to the owner at the outset but it took almost a week to convince him of this. At the end of our first week there was a thunderstorm while we were away from the property and on our return the TV lounge and the study were flooded and rendered out of use. This necessitated a move out of the property for the two weeks remaining of our holiday to another farmhouse on the outskirts of Jugon Les Lacs which the manager sourced for us. This property was pre-booked by other clients for the final three days of our holiday and we had to move again! Whilst the owner funded the cost of our remaining accommodation there has been no apology except by his manager who was extremely sympathetic to our situation, but there has been no offer of any compensation. The very least we could have expected is a refund for the days we spent in Les Vignes and the two days lost in transferring to other properties...a total of 9 days and a personal apology from the owner. We are all in our 70's and found the whole experience both traumatic and potentially health threatening. We always try to give our guests the absolutely best holiday experience and so do our house managers, who go out of their way to support our clients, which I suppose is reflected in our 31 previous 4 and 5 star reviews, including earlier this season. The house managers stated that they had cleaned the property to a very high standard, but I am sure that a few cobwebs may still have been present in such a large and characterful property, and they will certainly do their best to get all of them next time. There was, indeed, a problem with the internet service provider during the stay, but we got this fixed as quickly as we could and the wifi is now back to normal. We have never had any comments before regarding mobile phone connection, but this is rural France and the house has thick stone walls, which I suppose may affect reception in some places. There was also a torrential thunderstorm during this week, which led to some flooding on the floor of the study, and thus we have carried out some exterior drainage work to ensure (as best we can) that, even in the worst thuderstorm, no ground water enters the house again. In light of this, we did provide full compensation, which was agreed to, by moving these clients into alternative accommodation, which was much more expensive than what they had originally paid. This reflects our commitment to providing the highest quality holiday experience and you can rest assured that we will always go out of our way to support our clients as best we can.